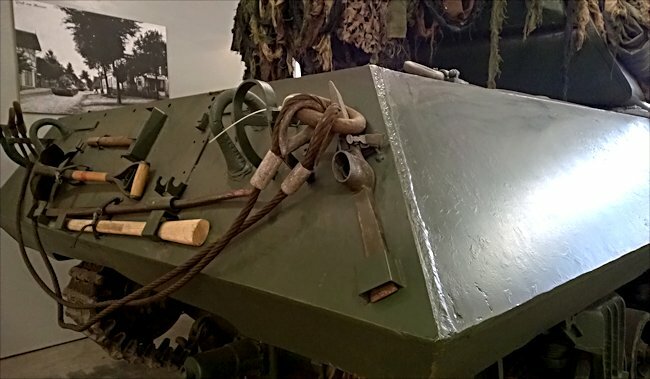 This British WW2 M10c Achilles MkII 17pdr Tank Destroyers can be found at the Deutsches Panzermuseum in the small military town of Munster, Germany. 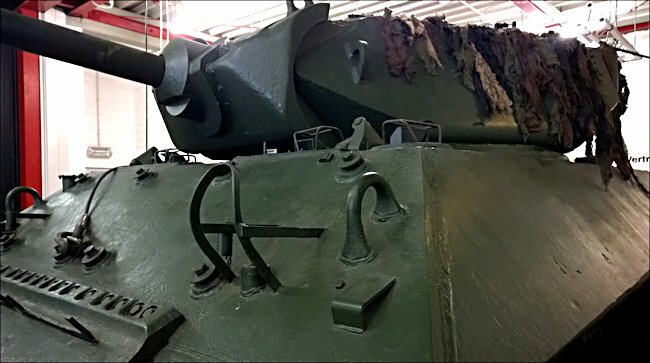 The M10c Achilles TD had to use Shoot and scoot tactics to survive because of its thin armour. The nature and reason for having mobile Anti-tank guns is that they were a defensive weapon. They were designed to be used firing from a hull down positions and withdrawing to the next prepared position until the attack was blunted or not. On Boxing day, 1944, during the Battle of the Bulge, an assault group from the German 26th Volks-Grenadier-Division, backed up by four Jagdpanzer IV tank destroyers moved north from the Belgian village of Senonchamps towards Hemrulle. They were spotted by American troops. Caught in the open by intense artillery fire, the infantry dug in and were discouraged from going on. The four Jagdpanzer IV tank destroyers continue to advance but suddenly found their way blocked by a large ditch. The defending American troops had already zeroed in their weapons and artillery at this location. They knew it would cause problems to an advancing enemy. Concealed M10 tank destroyers opened fire, followed by an artillery bombardment. All four German tank destroyers were knocked out. During the Battle of the Bulge in December 1944 in the Belgium Ardennes, M10 tank destroyers were used both by the Americans and British. 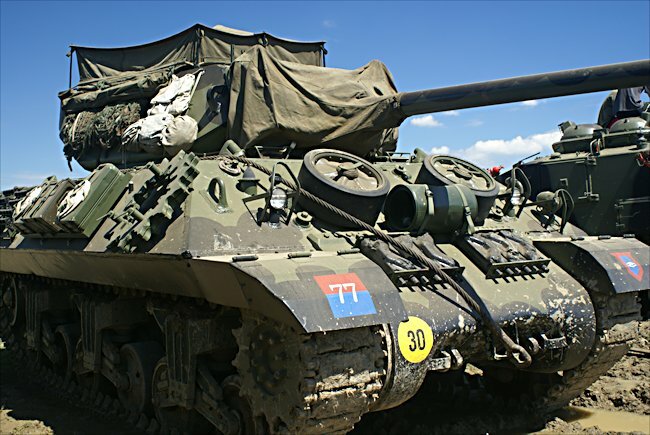 Although primary designed as a tank destroyer, the M10 also acted as an assault gun and mobile artillery support weapon. Paratroopers came across an American light tank that had been knocked out a few hours previously. The three crewmen were dead inside. It had been hit by a German Panzerfaust. As the paratroopers attacked this position, they were supported by six M10 tank destroyers. As soon as they were spotted the Germans began scurrying out of their houses. On the right side of the Sadzot road, where C company was advancing, was a particularly fanatic SS machine gun crew. They had set up their weapon on an incline just to the west of the houses. As the Americans advanced under a hail of fire, a 3rd Armoured M10 tank destroyer rolled up beside the paratroopers. A voice called out from the tracked vehicle above the roar of its engines. 'You guys stay down. I'll take care the bastards'. The tank destroyer fired one round from 76mm gun. Almost at point-blank range. The shells struck the SS machine gun sending pieces of it hurtling into the air and instantly killing the German three man crew. The other five M10 tank destroyer also provided supporting infantry covering fire with their main gun firing high explosive HE shells and raking the area within machine gun. Luckily, the Germans had run out of Panzerfaust rockets which the M10's thin armour would not have been able to protect the crew from, but the armour was thick enough to protect them from heavy machine gun fire. M10c Tank Destroyer turrets were open during WW2. Crews would erect canvas covers to protect themselves from the elements. 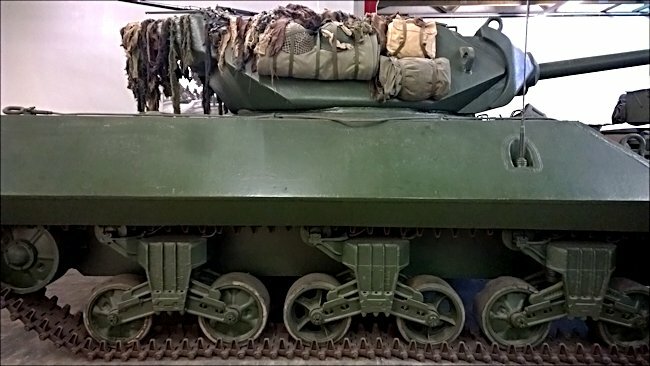 This is an M10c the 17 pdr armed version of an M10 and is marked as a 21st Anti-tank Rgt Royal Artillery hence the Guard armoured division marking on the left mudguard. This AFV is 'The Cadman M10c' at the War and Peace event owned by Rex and Rod Cadman. 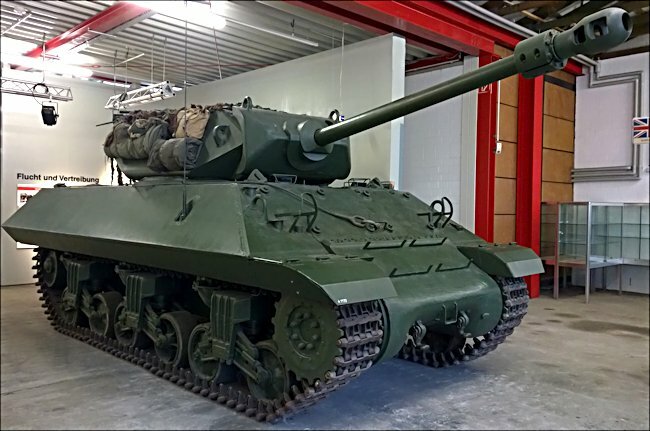 Where can I find other preserved M10c Achillies Tank Destroyers?